Update: Winners: Pareidolia: Monica Bradford-Lee and Matt Hertendy – enjoy the rubber chicken and see you next year! 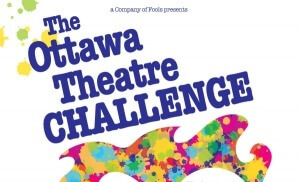 At the invitation of a Company of Fools, theatre companies from across the region have been invited to compete in a friendly Contest of Creation in celebration of World Theatre Day. Those brave enough to participate will have only 48 hours to write, rehearse, and produce a brand-new piece of theatre based on items of inspiration provided by their fellow competitors. A panel of esteemed judges will adjudicate the performances. Bribes are encouraged and trash-talk, laughter, and silliness are sure to abound, all in the interest of dethroning last year’s champions: Toasted Theatre Company, taking home bragging rights as Ottawa’s Best Theatre Company for the coming year and walking away with the privilege of holding the coveted Rubber Chicken Award. Participating companies to be announced. This event is sure to sell out fast and not to be missed! Cash bar, 50/50 draw and more!